United States Glass Company (U.S. Glass Co.) was a trust formed by the combination of 17 existing glass companies in 1891. The footprint of those 17 factories spanned Pennsylvania, West Virginia, and Ohio. On top of the 17 existing companies, U.S. Glass Co. also built a few new factories, one in Gas City, Indiana (circa 1894, aka Factory U), and one in Tiffin, OH (which appears to have been Factory R, the former A. J. Beatty & Sons factory). Although the Tiffin factory had been an existing structure, they had it rebuild in 1893 and it served primarily as their hand-worked glass operation. In 1895, they also built a factory in Glassport, PA, called Factory GP. 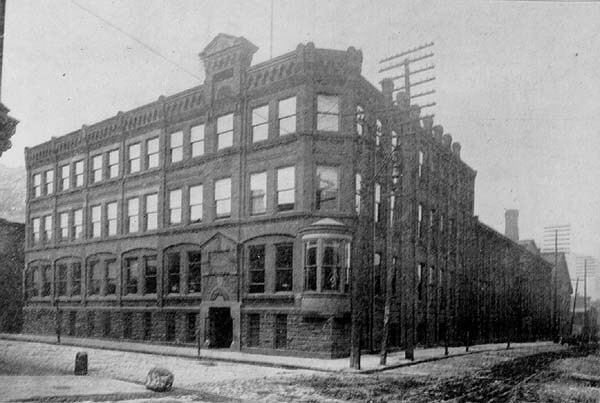 At the time of formation, U.S. Glass Co.’s main office was in Pittsburgh, PA, at the corner of S. 8th and Bingham Street, in the former Ripley Glass factory, known as Factory F. U.S. Glass Co. remained headquartered there until 1938 when they relocated to Factory R in Tiffin, OH. Adams & Co brought with them a pattern called X.L.C.R which had been released in a limited piece count just the prior year in 1890. While working as part of U.S. Glass Co., the X.L.C.R (aka Excelsior) pattern was greatly expanded to many different pieces, all created and stained at Factory A. Main production of this pattern line lasted till around 1904, where records seem to indicate that the pattern was generally discontinued from the production line, but did linger in resale via their catalogs until 1926 when it disappeared altogether. The end of the 1800s saw a lot of hardship for U.S. Glass Co., in the form of competition, union strikes, and a rapid shift in public opinion of many of the older patterns they were producing. Before the end of 1899, U.S. Glass Co. saw the closing of at least 9 of their factories. By the time they relocated their main office in 1938, they were down to just a few factories in PA and OH. Fast forward to 1943. Since 1904, the country had started and ended World War I, struggled during The Great Depression, started and was in the process of wrapping up World War II, and saw the first fully automatic digital computers come into use. (For Downton Abbey fans, that fictional world was from 1912 to 1925). Life for the average person in the US had been difficult, luxuries were few, and the day to day existence resembled nothing of the Victorian Era we were in just 40 years prior. Towards the end of the 1930s, there was a resurgence in popularity for historical dishware and stemware patterns. Capitalizing on this, U.S. Glass Co. dug out the old X.L.C.R. pattern, reworked the pieces to fit the 1940s dining habits (an individual table salt? How gauche! ), and re-released the pattern calling it Dubonnet. Historical experts believe that they appeared to have reused the original X.L.C.R. moulds for the stemware, but created entirely new moulds for the serving pieces. Personal sidenote: There were only three sizes of stemware released as X.L.C.R., and I’ve quite a few of each size in our collection for reference. I’ve also all of the glasses released as Dubonnet. Although I do see some similarities between the well-moulds on a few pieces, the stem moulds are quite different and the well-moulds on the Dubonnet goblets, clarets, and wine pieces do not resemble the older pattern. Production of Dubonnet was done in two locations. Factory GP (Glassport, PA) created the mould pieces, and then shipped them down to Factory R (Tiffin, OH) for the hand-working assembly and hand-blown components. For the first two years (1943 to 1945), for those Dubonnet pieces which were not released in plain Crystal, the Ruby and Cranberry staining was done at Factory R, and characterized by both a stain on the rim, and a second stain on the bottom of the stemware well. After that, if you purchased a stained piece, it was typically done by a third party manufacturer and not U.S. Glass Co. Welcome to 1952. NATO approved a European army, the US explodes a thermonuclear bomb at Enewetak Island, Dwight Eisenhower visits Korea, and the N.Y. Yankees beat the Brooklyn Dodgers 4 to 3. Oh, and we see the first reference to the name "King’s Crown" in U.S. Glass Co. catalogs! It is at this point that we also see the pattern listed as #4016, and sometimes referenced as Thumbprint and Old Thumbprint in some advertising. Since the mid-1950s we saw the company try to modernize the look of the pieces with a blue stain, a copper and gold paint, and an all-gold look for the salad plate and all stemware. None of this had a positive effect on sales, and the pieces were still being hand-pressed, which had a growing cost associated with it. In 1960, U.S. Glass Co. introduced machine-pressed pieces that would cost you about 33% less than the hand-pressed pieces. But those pieces were not as attractive, were more fragile, and overall disliked by the public. 1962 saw the last reference to any King’s Crown offering from U.S. Glass Co. Call this a "last ditch" effort. In 1961 U.S. Glass Co. released a limited subset of the King’s Crown pattern in four solid colors: Plum, Golden Banana, Empire Green, and Cobalt Blue (this color only available for the salad plate, and the stemware). All the mould pieces were the same as the King’s Crown line, and all were hand-pressed. Where you saw some difference was in the hand-worked parts, such as the rims, which often had more flare than the standard release, very evident in #4014-45, "Footed Crimped Bowl", which often had three waves/crimps instead of the standard four crimps. But this was short lived, and that line was discontinued in 1962. It’s the end of 1962, and U.S. Glass Co. is down to just the Tiffin, OH and Glassport, PA factories. They are down to very few standard patterns, and mismanagement and franchising of the King’s Crown pattern over the decades resulted in other manufacturers releasing the pattern in direct competition with U.S. Glass. Co., and often at a better quality and a cheaper price. Since 1959, internal memos revealed that an up and coming glass company, called Indiana Glass of Dunkirk, IN, had "copied" and "pirated" the pattern. U.S. Glass went into bankruptcy in 1963. In 1963, the Tiffin, OH factory was reorganized as the "Tiffin Art Glass Company" and began life as an independent company. On August 3rd, 1963, a storm toppled the water tower which sat on top of the Glassport PA factory, cooling the glass furnaces and leaving behind 250 tons of hardened glass that the company had no financial means to remove and repair. And with that disaster, the last U.S. Glass Co. factory shut down and was reduced to a pile of rubble via a bulldozer. There were rumors that Indiana Glass lifted a few of the King’s Crown moulds out of the debris, but that’s just a rumor. In the later years, U.S. Glass Co. often stuck a Tiffin sticker on everything they produced. This led to the commonly held belief that King’s Crown was made by Tiffin, as an independent company. Although the Tiffin factory played a vital role in producing King’s Crown, as well as producing many other very lovely glass pieces, King’s Crown was officially a U.S. Glass Co. product.